Novare designed an iconic pedestrian and cycle way bridge that achieved economy and beauty simultaneously. 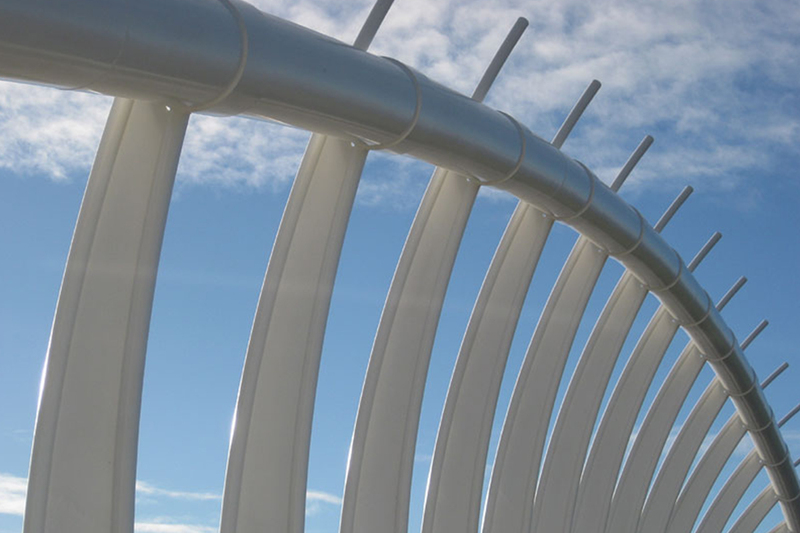 Not only has this footbridge become a strong community symbol and tourist attraction for the New Plymouth region, but a functional infrastructure asset as well. Te Rewa Rewa footbridge site stands 300m upstream from the river mouth, and acts as an extension of the existing popular Coastal Walkway and diversion of pedestrian and cycle traffic from public roads between New Plymouth and the suburb of Bell Block. The bridge itself is 3m wide between 1.2m balustrades. It spans 85m long, stretching across 70m of river with no temporary or permanent piers in the waterway. The deck soffit stands 4.5m above normal river level, and the asymmetric superstructure consists of 85 tonne of structural steel. 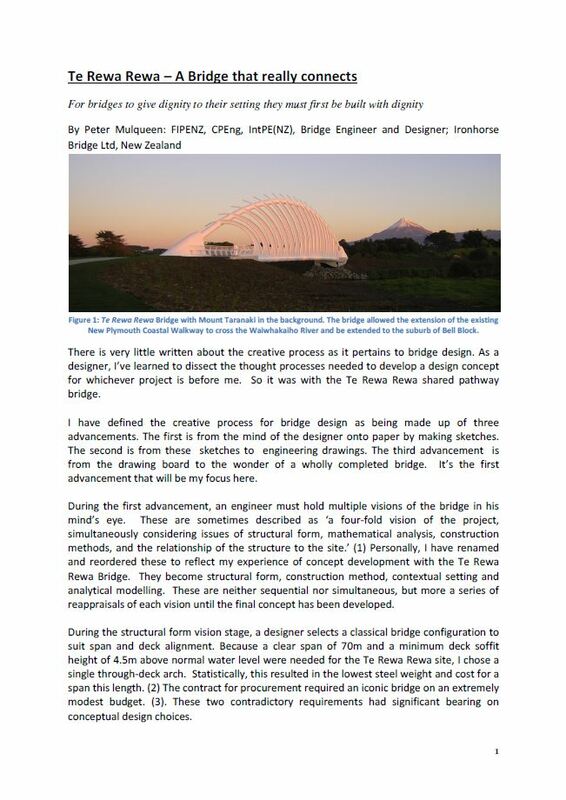 Situated on the sacred land of the Te Ati Awa iwi and Ngati Tawhirikura hapu, Council had a clear vision for the bridge to be iconic, yet respectful to the local iwi and environment of the area. This was challenging given the team was charged with creating a notable bridge profile on an extremely tight budget. Two contradictory requirements that would have significant bearing on conceptual design. The resulting design that took form strongly met client requirements – providing a visually stunning structure to the landscape. It’s structural integrity and construction however posed challenges due to its complex geometry and the need for the structure to be transported to site versus built in-situ. On top of this, prevailing winds coming in over the Tasman Sea caused concern as it meant the proposed structure would be subjected to both pedestrian and wind-induced exitation. It was clear that vibration serviceability criteria would have to be achieved to meet heath and safety requirements. Novare were very mindful of the history of the land which was the sight of the Musket and Taranaki Wars as well as it’s confiscation from the iwi by Crown. As a result, designing a bridge that captured a sense of the prevailing west winds and the idea of transformation and wairua (the spirit of the lives lost on the land). This was achieved through a series of curved ribs that asymmetrically connected the deck to the arch to form a gateway symbolic of entering or leaving sacred land. Together, the 19 curved ribs and skewed arch alignment provided Te Rewa Rewa with its most unique feature that gave strong links between the structure and nature. It was also positioned to align with the summit of Mount Taranaki to engender a feeling of peace, harmony and connection to the local environment. The arch itself was designed with a span-to-rise ratio of 10 so that it didn’t dominate the low hills of the Pa site as well. To overcome budget restraints, the project was engineer led, and local engineering company Fitzroy Engineering Group were contracted for the steel fabrication. This ensured strong technical understanding and experience could be leveraged to streamline processes. And, having a team based only 1.5km away from site also reduced travel and associated transport costs. Material costs were reduced through a tiered arch approach so the superstructure could be fabricated in a workshop and transported to site as one element. A large circular hollow core (LCHS) section was used during fabrication as it could be curved by induction bending. Providing a cost effective means to form the parabolic profile while giving sufficient scope to select a suitable diameter and vary the wall thickness according to load demands. In the exploration of structural integrity and buildability, a series of simple models, manual calculations and finite element analysis were leveraged to understand the behaviour of the concept. This involved classical arch theory to determine axial loads, beam-on elastic foundation models to determine the effective length for out-of-plane buckling conditions, as well as consideration of a low ductility and elastic response for positioning of potential plastic hinges from seismic excitation. The basic superstructure skeleton was made of three tubes which became the arch, heel and toe tubes to provide lateral restraint to the arch and prevent buckling. They were sized to provide sufficient torsional stiffness in addition to their requirements to carry axial and flexural actions. The fundamental load of vibration was 1.3Hz in the torsional mode with the first horizontal and vertical modes surpassing the requirements of B55400-2: 2006 Annex B to meet vibration serviceability criteria. To ensure safe transport to site, a steel springing connected the ends of the arch and deck at both ends of the structure to prevent ends spreading. Distortion due to vertical and transverse eccentricity of the arch were mitigated by temporarily designed diagonal deck bracing and tension ties. Overall, Novare designed and delivered a stunning example of an iconic bridge sympathetic to it’s surroundings and the cultural significance of the sight. As both a functional infrastructural asset and an enduring attraction for the community – it’s innovation in construction method, fabrication and material selection kept costs down and allowed strong technical understanding and expertise of local fabricator Fitzroy Engineering to be leveraged. If you’d like to find out more about this project, contact our members Novare Design or Fitzroy Engineering. * A special thanks to Peter Mulqueen for providing details of this project, who at the time was the lead designer for Novare for this particular project. View or download an indepth report of this project here!